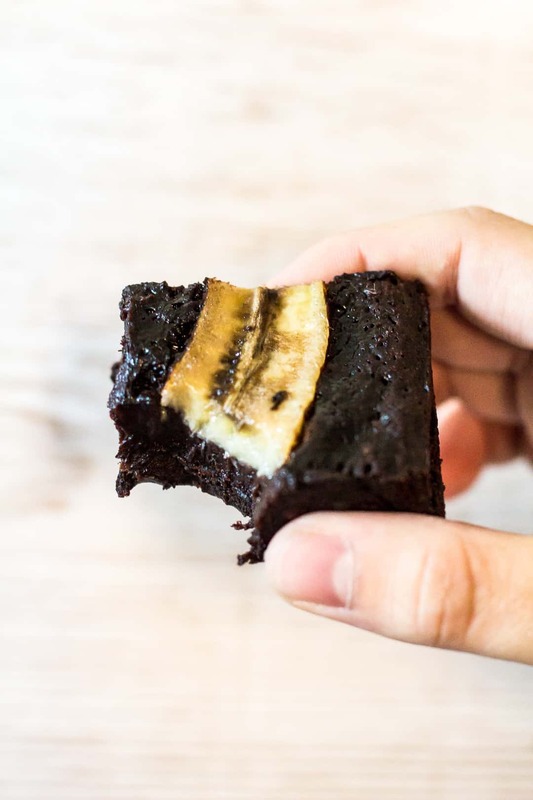 Fudgy Banana Brownies – These brownies are incredibly thick, fudgy, and loaded with banana flavour. Banana lovers will LOVE these! If you are a big fan of bananas (me, me! ), then today’s recipe is just for you. 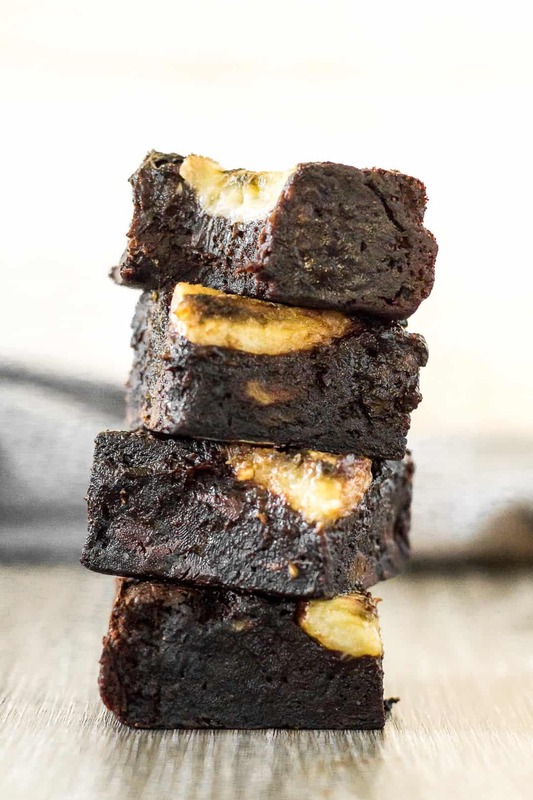 I have taken my favourite brownie recipe and stuffed them full of bananas, which makes for a SUPER fudgy and moist brownie. You’re seriously gonna love them! 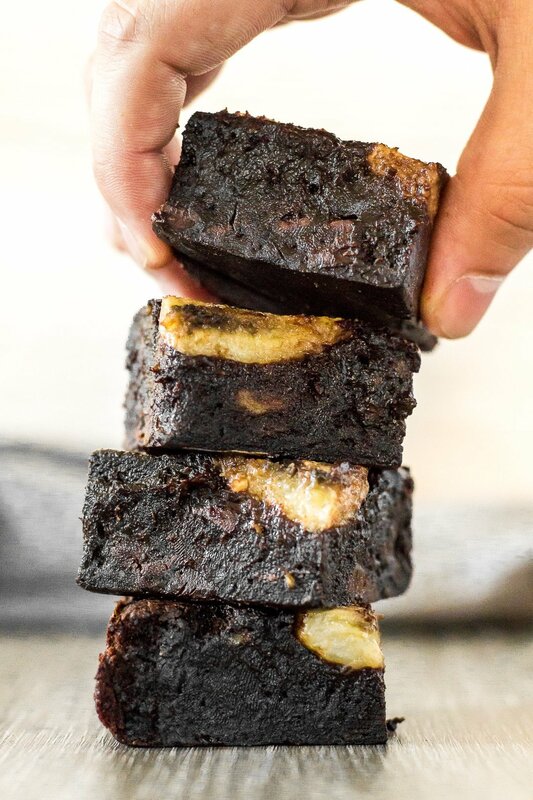 These brownies are loaded with 4 large bananas. Two mashed bananas go into the batter, and two whole bananas, cut in half, are placed on top of the batter. Mmmm. 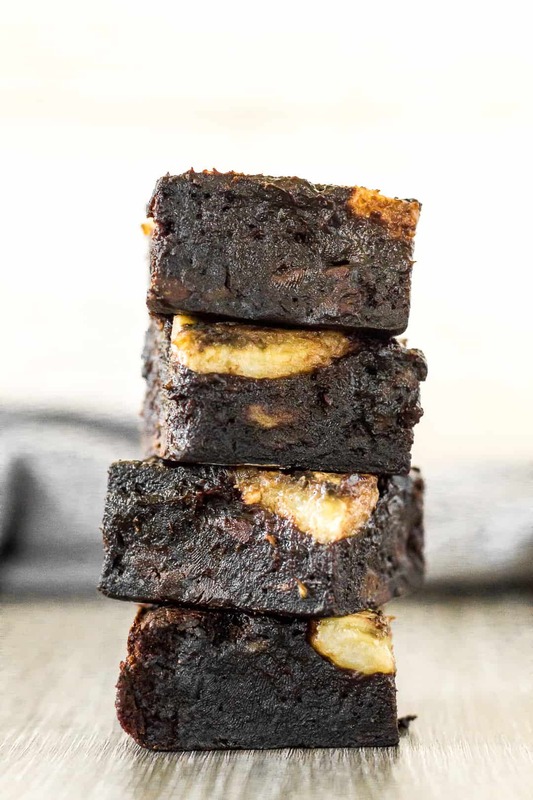 To make these brownies, add the butter, sugar, cocoa powder, and salt to a microwave-safe bowl, and heat in 30 second intervals, stirring after each one, until the butter is melted and the mixture feels very warm to the touch. Add the eggs, vanilla, and TWO mashed bananas, and mix until combined. Fold in the flour, then the chocolate chips. Pour the batter into an 8×8-inch square baking pan lined with parchment or foil, and spread out evenly. Slice the remaining bananas in half lengthwise, and place on top of the batter. Bake for 45 – 50 minutes, or until the centre is no longer giggly and a toothpick inserted comes out almost clean with a few moist crumbs. Allow to cool completely before cutting into bars. Because these brownies are incredibly moist and fudgy, I like to keep mine refrigerated and serve them chilled. Want to store these brownies, or make them ahead of time? They can be stored in an airtight container in the fridge for up to 1 week. They can also be frozen for up to 3 months. Thaw overnight in the fridge before serving. 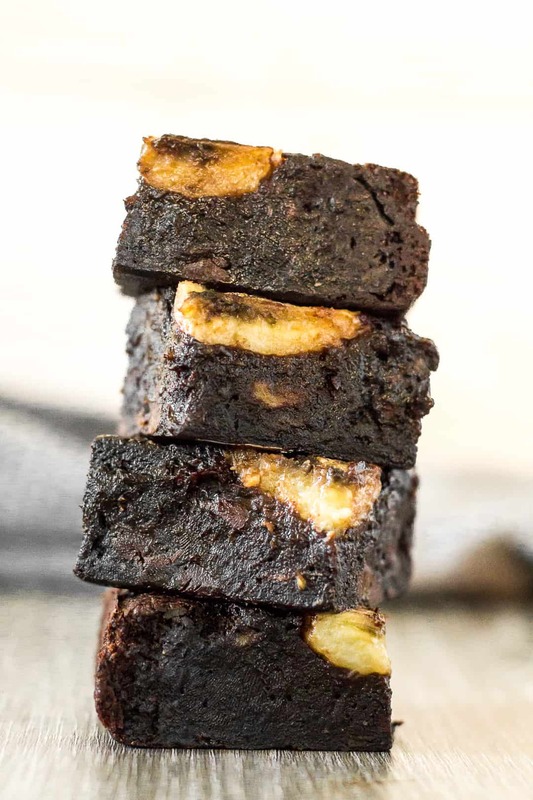 These brownies are incredibly thick, fudgy, and loaded with banana flavour. Banana lovers will LOVE these! Mix in the eggs, one at a time, then the vanilla and TWO mashed bananas. Fold in the flour until fully combined. Fold in the chocolate chips. Pour the batter into the prepared pan and spread out evenly. Slice the remaining bananas in half lengthwise, and place on top of the batter. Bake for 45 - 50 minutes, or until the centre is no longer giggly and a toothpick inserted comes out almost clean with a few moist crumbs. You may cover the pan loosely with foil past the 30 - 40 minute mark to prevent excessive browning. Allow to cool completely in the pan on a wire rack before cutting into bars. I refrigerated my brownies before slicing for extra neat, clean cuts. 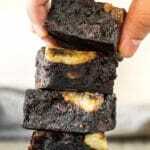 These brownies are best served chilled as they are very moist. Woah Marsha! Those are some mega fudgy brownies. . .just the way I like them btw. And the addition of the banana is genius. I just love how that yellow pops up against all that fudginess. I made these Saturday afternoon for dessert. OMG their so good you’d smack your mama, well not really. But they are amazing, you should make these! Banana and chocolate is such a great combination. The presentation is super as well. Thanks for the great recipe!